You are looking at a TRADITIONALLY-CRAFTED Talisman, lovingly created to provide you with a direct link to the powerful planetary Forces of Mars. 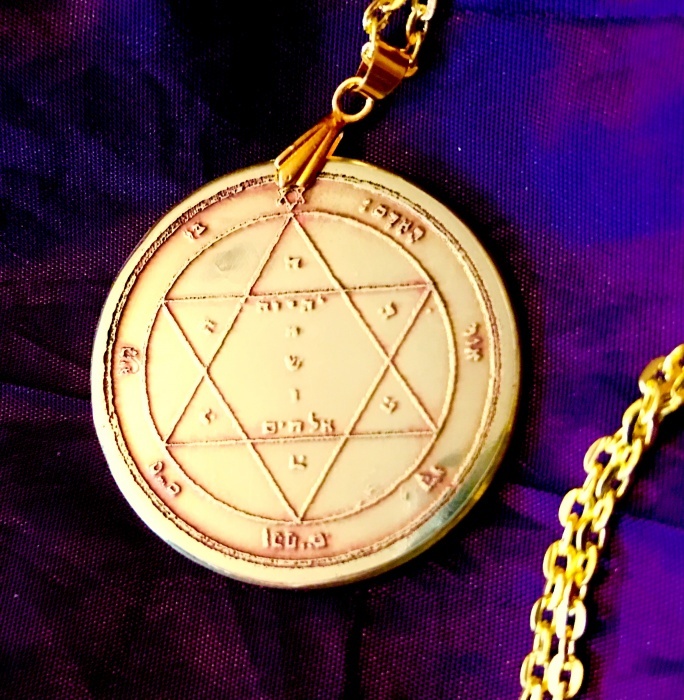 The Grimoire it is featured in states, "This Pentacle serveth with great success against all kinds of diseases, if it be applied unto the afflicted part." Editor's Note.--The letter Hé, in the angles of the Hexagram. Within the same the Names IHVH, IHSHVH Yeheshuah (the mystic Hebrew Name for Joshua or Jesus, formed of the ordinary IHVH with the letter SH placed therein as emblematical of the Spirit), and Elohim. Around it is the sentence, John i. 4:--'In Him was life, and the life was the light of man.' This may be adduced as an argument of the greater antiquity of the first few mystical verses of the Gospel of St. John. This STUNNING piece is as close to an EXACT REPLICA of those Talismans used by Occult Practitioners of times gone by, right down to the authentic patina that has been applied. This unique Talisman is constructed from SOLID, 1.2 mm THICK BRASS, with the Magickal Seal deeply inscribed into the metal itself. It has been designed to last a lifetime - and beyond. Your one-of-a-kind Talisman is TOTALLY UNIQUE; no two will ever be the same! This item is completely HAND-CRAFTED, in the traditional manner, by a true practitioner of the Occult Arts - absolutely NO MODERN TOOLS have been used in its painstaking construction. Your Talisman is supplied with a Gold-plated 18-inch Chain, and backed in deep burgundy velveteen, completely in line with Tradition. This item is NOT A TOY - Your Talisman is 100% authentically-made, in line with the Old Ways. (Please note: as Brass naturally tarnishes, over time, we do offer the option of having your Talisman coated with a specialized jewellery varnish, to preserve it's lustre. This option is FREE OF CHARGE, but you should note that it is not a traditional coating. If you require this, please add a note to your purchase. Your Talisman has been crafted using techniques from the Old Artes, in the U.K.'s City of Culture, Kingston-Upon-Hull, in the heart of rural Yorkshire. We are the first and ONLY supplier of these, world-wide! Once completed, the Angelic names and/or figures inscribed upon it mean that it requires no on-going charging whatsoever - the relevant forces for are constantly attracted to the wearer, whether they believe or not! In order to comply with Trading Law, we are obliged to state that this item is for decorative or entertainment purposes only, and any claims as to any other attributes cannot be substantiated...though your own experience may well differ! If you are not ABSOLUTELY DELIGHTED with your Talisman, simply return it to us in the same condition as you received it FOR A FULL PRODUCT-PRICE REFUND - NO QUESTIONS ASKED!